How quickly a year passes. I am seeing 2009 out by saying goodbye to a favourite painting that sold recently. I have learned so much from my art. Not just painting. I know when I look at a fresh piece of white paper I have that incredible feeling of excitement of adding colour to it.This is how I feel with a new year too.What will we all paint and achieve in 2010. It is time to say goodbye to yesterday and open our hearts and imaginations to our new tomorrows. My goal is to be a better artist............and work towards a very special dream. I wish you joy,happiness and all your dreams coming true in this new year. David Shepherd Wildlife Artist of the Year 2010 Competition’. I am saying goodbye to 2009 and giving a welcome to 2010 by painting from my heart for love and to help a worthwhile charity. " 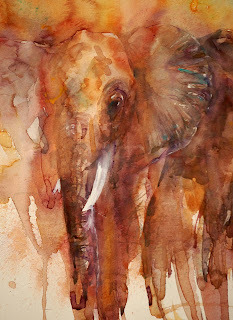 Glorious Giant" an original watercolour of an elephant by Jean Haines was sold recently in the 2009 Art Liberating Lives Exhibition at the Mall Galleries,London in aid of Sue Ryder Care. 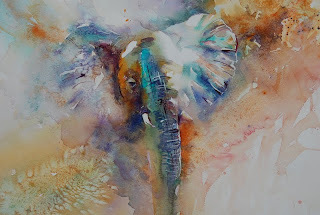 Elephants seem to have played a "mammoth" part in my watercolour journey in 2009. 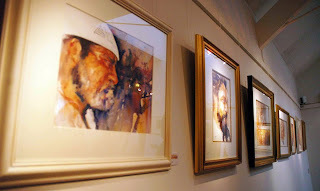 They have been a favourite subject in all of my exhibitions and have led me to meeting some incredible people. Each year I now host an African workshop which is usually fully booked the minute the dates are set because it has become so popular. In 2009 my Autumn session adopted an elephant and a moon bear from the David Shepherd Wildlife Foundation. In 2010 I hope to use the workshop to again help fund DSWF projects that are saving species in the wild. 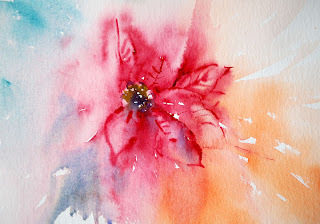 This month I was delighted to create a simple step by step demonstration for the email newsletter which has been circulated this week by the SAA, Society for all Artists. Quote : "In this exclusive SAA e-newsletter, PA Jean Haines demonstrates how to paint a gorgeous elephant in a loose watercolour style. This exciting step-by-step project is a great place to get some inspiration for the ‘David Shepherd Wildlife Artist of the Year 2010 Competition’. This competition is open to all amateur and professional artists aged 17 and over, the first prize is £10,000 with all profits from the competition going to help save wildlife! There are five categories: Endangered Wildlife, Wild Places, Wildlife in 3D, Wildlife in Action and Open, and a short-listed selection from each will be exhibited at the Mall Galleries, London in May 2010. The deadline for the competition is Friday 15th January 2010 – just a few weeks away!" 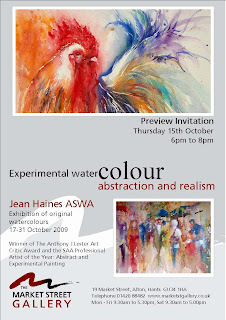 SAA members will have read the full feature where I used unusual colour combinations and water effects to create an unusual portrayal of a popular subject. Step 1. The Starting point had a fabulous formation of colour to create the centre of the elephant head. The background was full of rich colours merging with water to form " water illusions" which are now very common in my style. People who " follow" my journey in art are delighted to see how my growth in technique now brings these patterns strongly into play in a huge variety of ways. The contrast of vibrant directional brushstrokes in the foreground seems to make the background sing even more. When we paint we do so much. We " tell stories", we create illusions and we aim to portray any given subject in a style that is unique to us as artists who wish to be original. I am hoping via my art I can do more than simply create paintings. I want to help others via my passion for watercolour. My paintings in 2010 will strive to be full of obvious emotion, life and movement in a unique way. I am aiming to achieve more for charity and improvement as artist than I have in 2009 so I am giving myself quite a challenge! 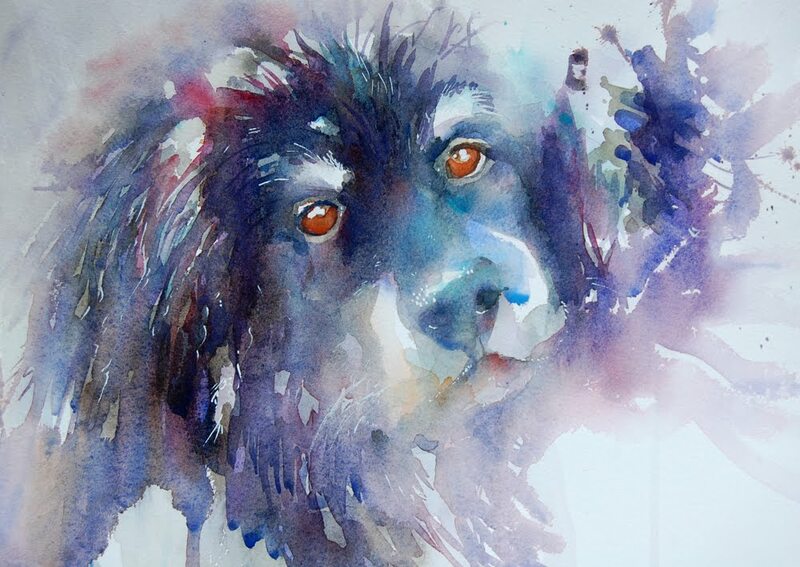 At this time of year it is really difficult finding the time to paint.But if watercolour is as much an addiction to you as it is to me a day without picking up my brush is sheer agony. Over the last few days I have quietly allowed colour to literally run on an easel placed at an angle to see what could emerge. Poinsettia are the perfect flower to create almost abstract images from. 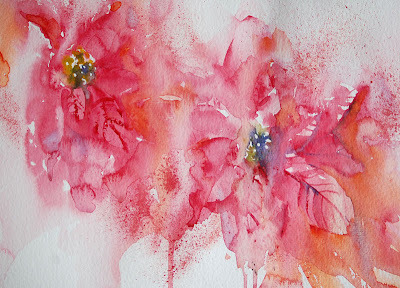 My initial paintings were formed like "Poinsettia Promises" seen above using mainly Alizarin Crimson and Cadmium Orange. But then I decided to explore using a wonderful blue for a half background to contrast with my orange. Here I am working further to bring out individual petals. From these studies of a size of 18" by 12" I have gained some incredible ideas for beautiful ful paintings using texture and placement of not only my subject but also my colour for interest. 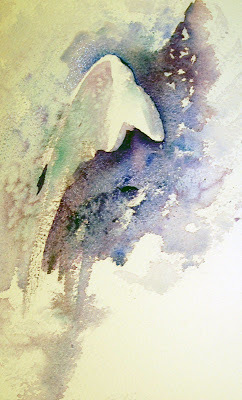 I also have ideas for brilliant projects to work on in 2010 so I hope you are as eager to paint next year as I am! I had such a beautiful email yesterday from someone newly following my blog. Thank you so much and to everyone who has added their name as a follower too. I had an idea for the new year to share monthly projects as I know some of my friends find it hard to find inspiration or even the motivation to pick up a brush on a regular basis. This will be a great commitment for me to also paint a suitable subject each month! I will think about setting up a link to the project zone and send invitations to those interested in 2010.........lets see how many terrific paintings we can create next year! What colours would you use to paint this scene........?
" Pure and White " Snowdrop Study. Following on from the simple snowdrop study I have experimented with colour,salt and texture effects to achieve a soft snow scene of a group of snowdrops. Clusters of these small white flowers line the drive to our cottage .Many are often hidden under the shrubs that line the pathway so you may only see hints of their form rather than whole flower shapes. Studying and learning from nature is so beneficial to the artist who is passionate about painting every subject in a variety of techniques. I have a feeling many more snowdrop paintings are on their way! 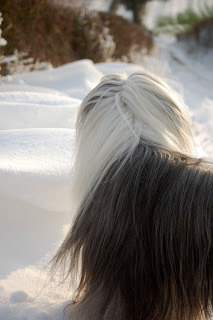 With beautiful snow falling outside the cottage I am looking back thinking of how I started 2009. 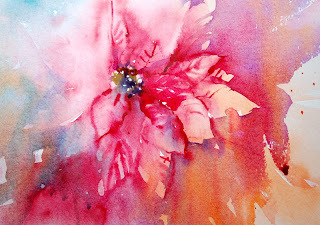 My first demonstration of the year was at Farnham Arts Society where I covered a number of subjects. The favourite appeared to be a simple study of a snowdrop. 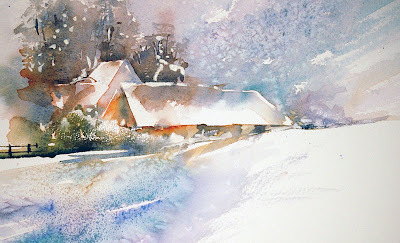 Looking at the snow today it is easy to paint one imagining how it would look covered with snow. 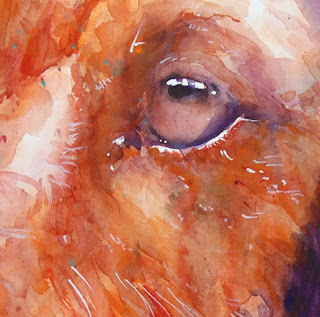 Here I have not used masking fluid as I find it can often create hard edges. 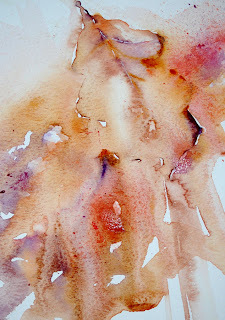 These can sometimes kill the feeling of the wonderful light I am aiming for to add excitement in my finished painting. Today I walked past a local farm in the middle of country fields. It looked just like a scene from the cover of a chocolate box / I couldn't help painting it as such exaggerating the colours and hinting at warmth missing in the winter scene of cool grey and violet. These quick studies on scraps of paper are a wonderful way of warming up before tackling a serious painting. 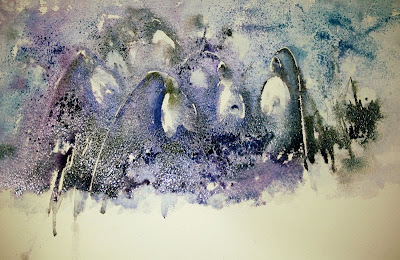 I have ideas now on how to create a beautiful large scene of snowdrops and the farm could make an amazingly colourful abstract if it lost the " prettyness" and became more expressive with energetic and varying brushstrokes. Out of interest all the local shops are running out of salt as everyone is laying it on paths, lanes and roads to prevent slippery icy roads. 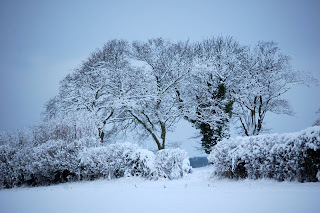 I am keeping my supplies for snow scenes locked in my art studio where it is hidden only for my use! We woke this morning to beautiful soft snowfall. 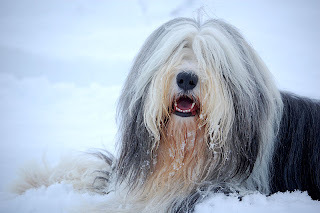 This meant there was a wonderful opportunity to take my Bearded Collies for a walk and capture images to paint in my studio long after the clear white blanket has disappeared. 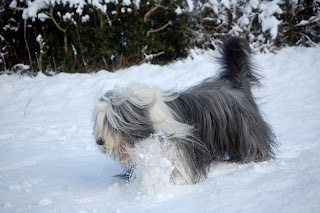 Bailey is still very much a young pup when it comes to playing in fresh snow and for me,makes a gorgeous subject in a variety of poses. 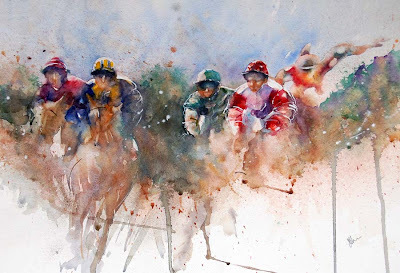 This is a favourite to paint as the composition is almost perfect for what I have in mind. 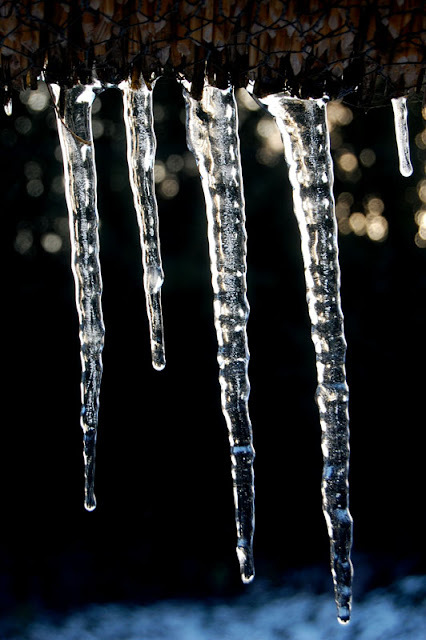 I am fascinated by nature and the almost abstract patterns to be found throughout each season.These icicles adorning the front of our cottage make brilliant patterns and shapes. They almost seem to form a magical curtain of glittering lights in the afternoon sunshine. 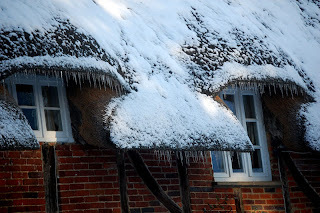 The thatched cottahe where I live adorned by a curtain of icicles. Natures Christmas decorations. Watching the afternoon sunlight play on these amazing shapes has given me so many ideas for new paintings. Seeing through the eyes of an artist can be absolutely magical! A Christmas Wish Come True.
" 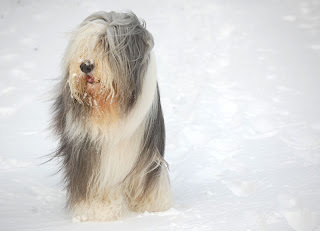 All I want for Christmas is..........."
Taffy our Bearded Collie in Santa Hat! While I am recovering from surgery placing gifts under the chimney to make our cottage feel as though Santa has paid an early visit a brown envelope arrived by post. I knew immediately what was inside.This year I recieved the most exciting gift of all as a dream I have long carried is about to come true. I have always wanted to write a book on watercolour. Over the years so many people have asked me to do just that sharing my way of working and ideas. At the beginning of this year I was in touch with a publisher who started the magical journey to this dream coming true. And so I came to hold the first proof in my hands and read the text along with seeing the images in print for the very first time. I held the package for the longest time before I opened it as the feeling of knowing what the contents were was so wonderful I simply wanted to hold on to that sensation for the longest time. The feeling of excitement and joy from putting it all together over the last twelve months is so hard to describe but this will be my happiest Christmas. In another way I also feel as though I am giving gifts to friends all over the world who I already know and those I have yet to meet via sharing my ideas and thoughts on watercolour. To all the artists and students along with friends who have told me I MUST write a book on watercolour I owe a huge thank you. I know I am so very blessed with wonderful people in my life who encourage me and enrich my life in so many ways. Sometimes I feel I live a magical dream so that even a minor blip of having to go into hospital at this time of year is nothing other than an excuse to rest before the next exciting adventure. 2010 will see a huge dream of mine come true along with many other exciting experiences from teaching in new locations and countries as well as continually sharing my passion in painting with watercolour. 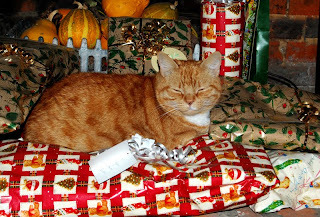 I wish everyone reading this blog the happiest of Christmas and a wonderful New Year to follow! 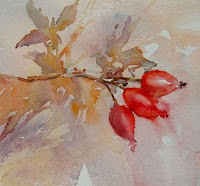 Inspiration has been surrounding me the last couple of months with temptations to paint every time I go for a walk.But the rosehips are now all that is left as leaves have fallen from the trees while the Winter Season approaches. Large and small paitings from studies of Autumn subjects have adorned my art studio and many have already sold. I am eagerly looking ahead to 2010 and workshops all over the world. Invitations to teach in Norway,France and Portugal are on my schedule along with many other exciting events. It really is going to be a very exciting and interesting year ahead of me. I open and close each painting session with warm up exercises on scraps of paper. I often see faces in the colour combinations and this one in particluar made me smile. I wonder if you too can see the Spanish ladys face considering I was playing with colour and not aiming at painting a subject during this exercise? It isn't easy keeping a blog up to date as I am so busy with exhibitions and workshops along with writing continually but I will add as often as I am able to. It does feel very strange sharing when you have no idea who is reading what you type. Or even knowing if anyone is interested! Next week I will be in hospital so my blog may be quiet for a while but I will be back and sharing soon. Life threw me an unexpected reason to worry but I know I am still very lucky and I will be better. Many people would love to be able say that. Have a wonderful week and happy painting to all my artist friends. 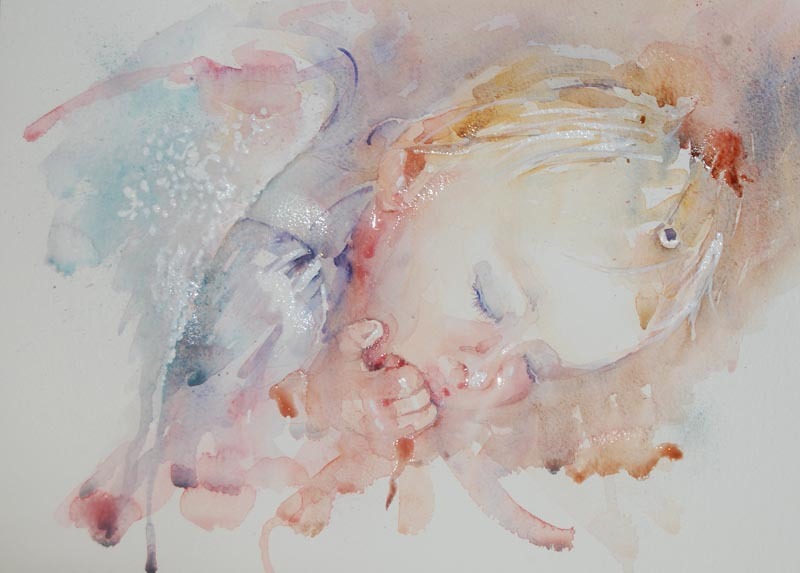 "Sleeping Angel" inspired by Amy, my God daughter. There are times when it genunely feels as though love touches our paintbrushes. Either we have completely fallen in love with our subject or we want to create a piece that captures our emotions whilst we are painting. A very dear and close friend of mine passed away some time ago and I still miss her terribly. Her daughter is like my own and her children especially Amy look like an angel. But don't all little ones when they are sleeping? Porcelain skin tones and a sweet innocent face sinking into soft bedding. My interpretation of a familar pose left me feeling peaceful as lullabyes long forgotten flooded my mind. Bringing back many happy and sad memories as I felt that tug of love in my brushstrokes throughout painting this study for the larger piece. Painted for the love of Amy.......for Amy........and thinking of Anwen my own daughter at the same time. An emotional painting capable of tugging heartstrings and definitely full of love. 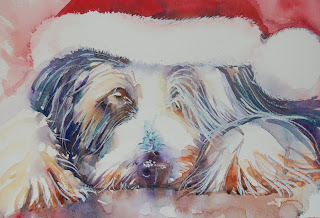 When I started this blog I had some wonderful messages letting me know friends were delighted I am sharing studies and my art online other than on my website or in Facebook, which I tend to use more for family and friends. 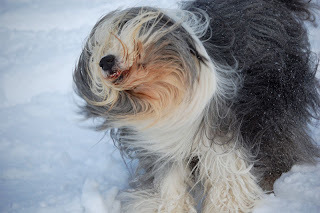 I hope a few smiles will appear when I share this update! 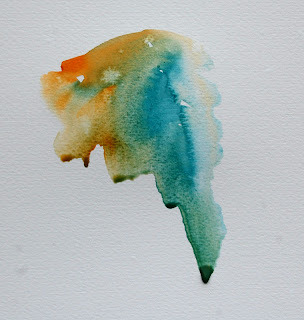 Time spent simply playing with washes always inspires my larger paintings. I often come across simple ideas that act as a base for future work on a variety of subjects. Painting for exhibitions, galleries and commissions leaves me often looking back at the days when I painted purely for fun. Often never worrying whether I would complete a piece or even have a successful result. 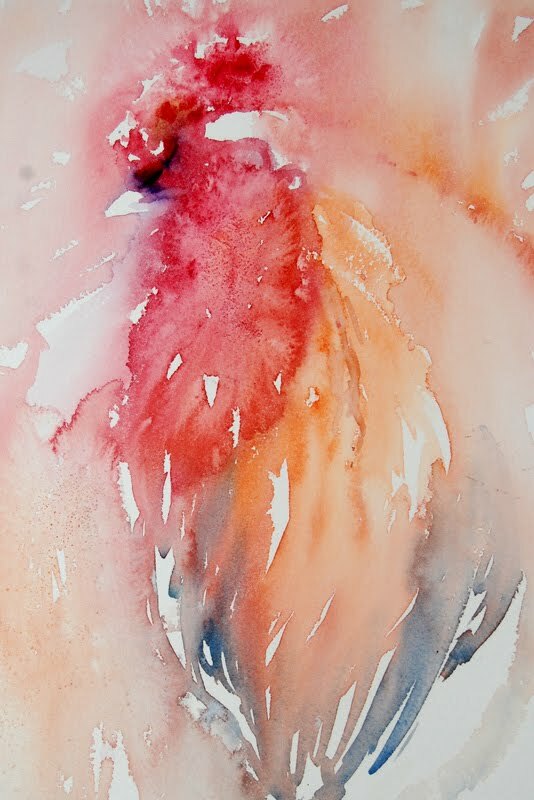 To keep that wonderful feeling of "being new" to watercolour alive I explore ways to improve my work at every opporunity. My latest paintings and my recent journey in art has led me to a point where I am having a fantastic time looking ahead to what I want to achieve. The most amazing situation is that I have been writing a book on watercolour and I have taught myself so much in the process of creating it. It has been as though I have been sitting on my own workshops and enjoying every minute. The project has enriched my life far more than I ever could have expected. 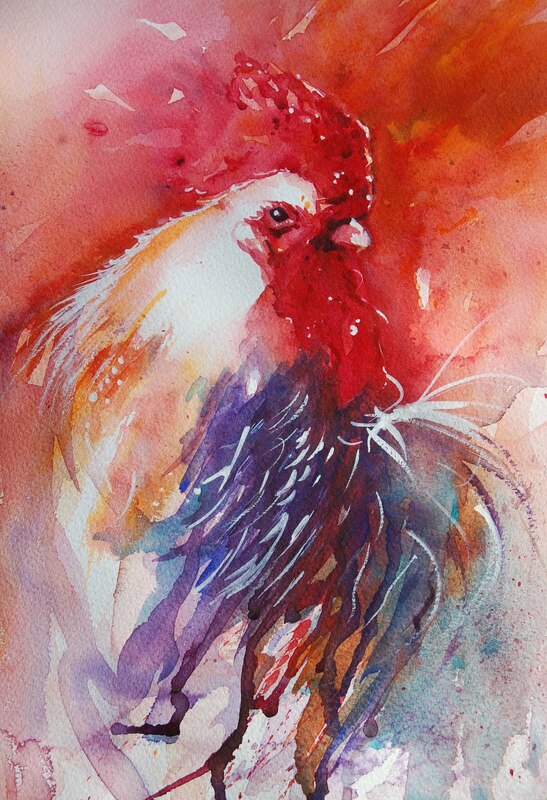 Cockerel Study No 1. Playing with an underwash to act as the foundation for the further brushwork. Just a very loose wash that tempts me to work further in my favourite technique. I am developing a new approach to underwashes, mid layers and final details which is so exciting to explore and believe in. House Of Lords and Africa? What an amazing life I lead. I had started a blog with the intention of adding on a regular basis but my life is so busy I find it impossible to share online in any form lately. But here is an update of all that is happening with me at the moment and a tiny clue as to why I am "quiet" as a blogger! Last week I was invited to the House of Lords. I met so many fascinating people and my heart was touched by the charity organizing the event in such an incredible venue. International Childcare Trust.......helping children in need from all over the world. You can find out more about the charity via this link. SWA Society of Women Artists and FAS Farnham Arts Society. My week was full as I had two committee meetings. The SWA Society of Women Artists and the Farnham Arts Society. This meant I was in London on Remembrance day,observing the two minute silence after witnessing the scenes of the day which were very emotional. SAA Society for All Artists Paint Magazine. This week is full yet again with the last in the series of "How To Paint Dogs in a Loose Style" for the SAA needing completing and I have work to complete for my book which is to be published next year. I am looking at members paintings that have been sent in following my series and I feel so in awe of art from working minus a pencil and just working with colour directly. I am thrilled by the response and in love with many of the paintings. 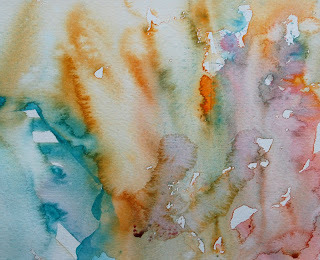 A colourful wash from an "Africa" workshop session.......this painting will also be donated to charity. 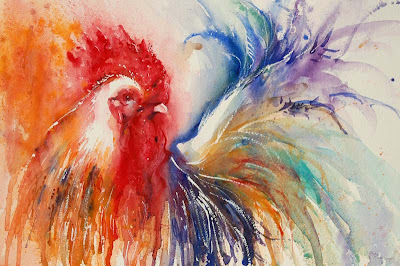 Every Monday sees me start the week with Administration and requests for my Watercolours With Life Workshops are really taking over my inbox along with requests for demonstrations. Life is so wonderful and I know I am blessed to not only see and live as an artist but also have the opportunity to help charities I feel passionate about with my work. Once upon a time it was enough to paint an image,feel the result was successful and frame the piece. Then it was exciting to sell. to know someone loved your work so much they wanted to own it. Now that isn't enough. Now there is more of a challenge to see how much I can achieve to help others with my art. Life is to me about giving........and if what we give is genuinely from our hearts our lives really are worth living. I wish everyone reading this a wonderful week ahead with many fabulous paintings in it or special memories created. 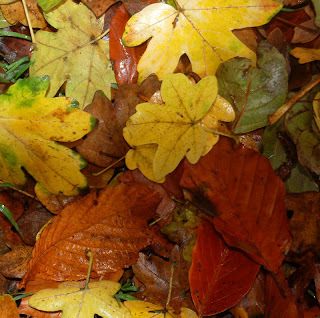 Autumn is an inspiration to my palette. Each day I see new colour combinations and ideas for compositions that are unique and interesting from sights full of incredible formations. As an artist it is impossible not to be motivated to race home and pick up your brush from morning walks on carpets of leaves in shades of red and gold. It is a sheer delight to simply play with pigment to see how it interacts allowing shapes to form rather than make decisions on painting a definite subject.Although I know from these studies this is where I am heading. To a large Autumn Scene that captures the atmosphere of the countryside at this time of year. Last week saw me very busy with gallery visits delivering work and organizing exhibitions for 2010. I also heard news that a painting I had donated to a charity auction for the Judi Meadows Fund raised a bid of £1000 which I am very touched by. We can never step into anyone elses shoes but if there is something we can do to help,offer support or simply show we care then that makes our lives enriched and far more worth living. You can read more about the Judi Meadows Memorial Fund via this link. 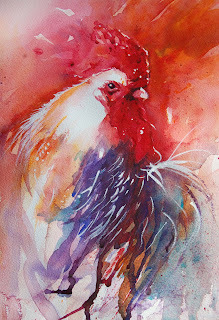 Art to me is a part of who I am,I feel passionately about watercolour and if by my love for this medium I can help others in any way I will continually aim to do so.....knowing that at any time there may be a moment when I too will need that comfort or support or love coming back to me. Finally I have just recieved the latest issue of the SAA Paint Magazine and seen my recent feature on how to paint dogs in a loose style. It has been such a joy to recieve feedback from SAA members who have loved the series, reading about how the style has been followed. I am so blessed in so many ways......my life is a blessing and in it I daily come across amazing people from all walks of life who fascinate me,become firm friends and share in so many ways. A White Piece of Paper? I love waking on a Monday. To me it represents a white piece of paper. 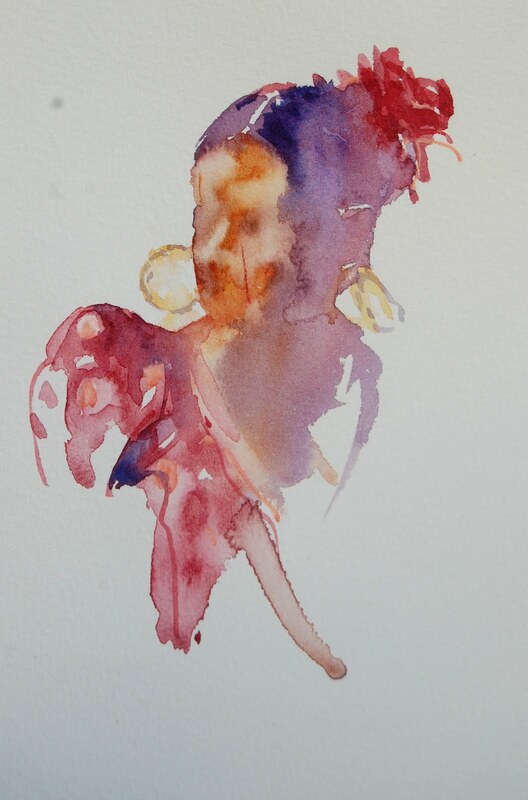 I may have ideas on what the week will bring but just as when you start a painting in watercolour, surprises are always waiting around the corner. I know I have a diary full of commitments and a studio waiting for me to pick up my brushes. By Friday I should be able to look back with a smile and see what I have achieved in the last few days. I am certain that wonderful word "smile" is the most important secret for a happy and successful life! This weekend saw the close of my latest exhibition. It was a really wonderful experience meeting so many people at the preview and at workshops hosted by the gallery. Part of this collection has been purchased by a British Embassy including two of my favourite paintings. "Showing Off" which was featured in Hampshire Life magazine and "A La Marche" which was the winning experimental painting in the SAA Artist of the year competition earlier this year. Appropriately the lucky black cat that has sat in my studio bringing me luck for the last twelve months also sold along with all the cards for each of the main paintings in the show. So I need to paint myself another "lucky" painting and quickly! Maybe 2009 has been the most exciting of years when I look back at my journey from January to now. I have held and been involved in several exhibitions, been elected as an Associate Member of the Society of Women Artists, won awards and met many incredible people on my Watercolour Workshops. To everyone who has been a part of my journey and to all I have yet to meet welcome to my blog which I will hopefully enjoy sharing on as time goes by!